GoldSilverBitcoin – The Super Bowl’s golden anniversary is coming up this season and the NFL will be celebrating with the ultimate symbol of wealth: gold, the commodity which served man as money for many centuries. 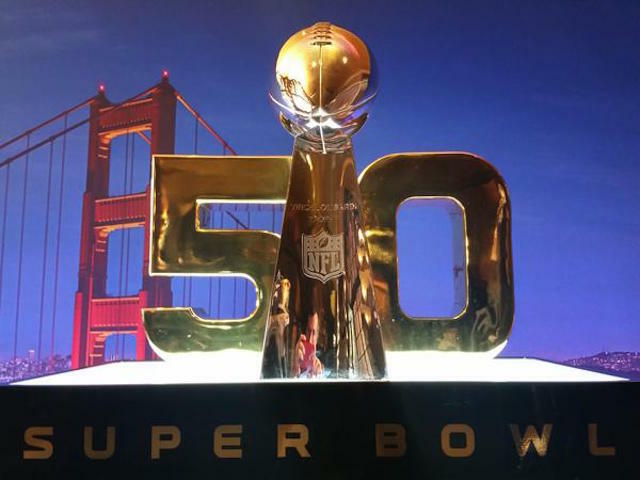 During the 2015 season, NFL fans will see gold everywhere as the league prepares for Super Bowl 50, which will be played on Feb 7, 2016. The “golden celebration”, as it is being marketed, will kick off at the NFL Draft. Each drafted player will be given a team hat with a golden NFL shield logo on the back. The above photographed golden footballs will be handed out by players to their individual high schools. Why might the NFL choose the color gold? It is indeed a loaded color, which much history. Gold has been highly valuable for centuries, used as coinage and jewelry, as well as for other arts, since long before recorded history began. The gold standard was implemented as a monetary policy within and between nations, though gold coins ceased to be minted for circulation in the 1930s. In 1971, the world moved towards a fiat currency system, which means that government dictates the value of money. Gold has been considered valuable because of its medium rarity, easy handling and minting, easy smelting, non-corrosion, distinct color, and non-reactivity to other elements. Just 174,000 tonnes of gold have been mined in human history, according to GFMS as of 2012. That is about 5.6 billion troy ounces. That’s less than one ounce of gold for each person on the planet. I don’t mind any of the ideas, but since the NFL is centrally planning it all, I suspect it will somehow go horribly wrong.